A collection of 25 recipes for inspiration when you are looking for something to make with ground beef. My husband is a hearty meat and potatoes man and ground beef is a great way to fill him up. It's certainly one of my most favorite and economical ways to stretch out a meal. 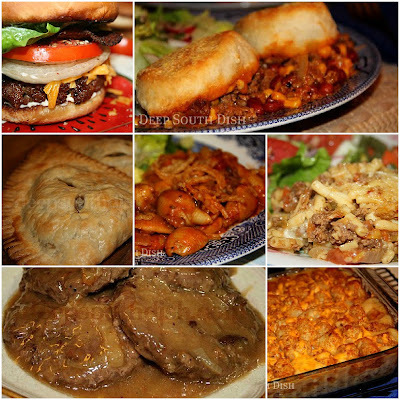 I've had several readers lately looking for ground beef recipes and asking for some ideas of what to do with ground beef, so I've gathered together a collection of some of our favorite ground beef recipes here on Deep South Dish. You'll find meatballs, meatloaf, burgers, sandwiches, casseroles and more. Click the link or the photo to see the full recipe and to print them. I hope that you'll find something you love! 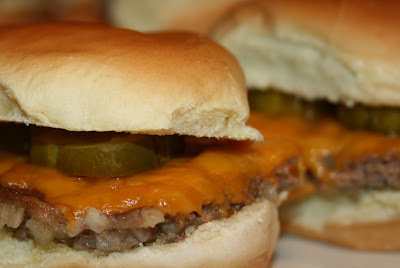 Want more ideas for things to do with ground beef? Click over to my updated list where you'll find another 23 more recipes! A little different from your regular burger and a favorite diner classic, Patty Melts are a grilled cheese meets hamburger kind of sandwich. 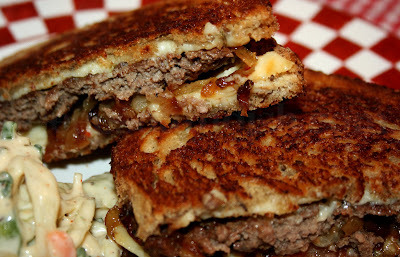 Made with very thin, oval shaped burger patties, and served on thin grilled rye bread, with caramelized onion, and Swiss cheese, they are easy to make and just amazingly delicious! Natchitoches Meat Pies are a favorite down in this part of the south. A simple beef and pork mixture is lightly seasoned with The Trinity and then fried or baked. 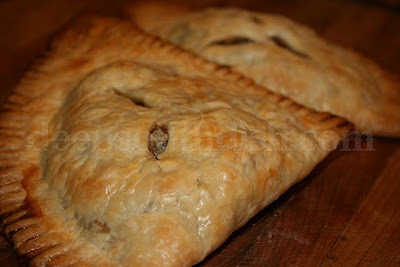 Just delicious and made super easy with a commercial pie crust. 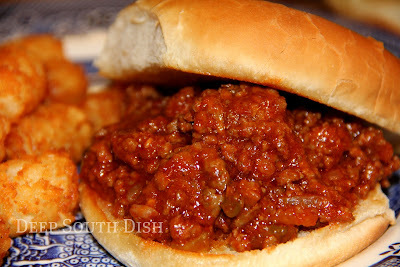 Whenever I serve these, Homemade Sloppy Joes my husband says "this is my most favorite food of all." Course he says that about a lot of my cooking, but I take that to mean he loves these simple homemade sandwiches. These Homemade Beef Sliders are a site favorite and it's easy to see why when you make them at home that first time. Great to have on hand wrapped up in the fridge. Once they cool off, stick them right back into the roll bag and then when you want one or two, wrap them individually in paper towels and microwave on high for just about 30 to 45 seconds or until hot. That's, of course, if you have any leftover, because make a batch and watch how fast they disappear. I just love this Hamburger Sandwich! The combination of onion soup mix with ketchup, mustard and sweet pickles combined into the cooked ground beef, makes it sort of like a deconstructed loose meat hamburger. 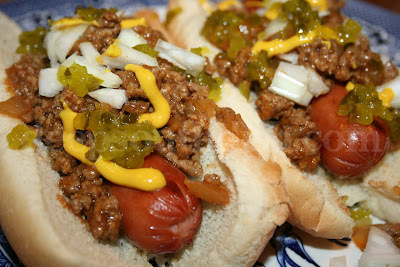 This can be served on buns or as pictured on French bread and then cut for serving. Try it - it truly is yummy! I first learned about Chili Spaghetti, or more appropriately, Skyline Chili, about 4 years ago from an online friend of mine Brandi, who lives in Ohio. She literally had to explain to me what this thing called Skyline Chili was, and to be honest, I didn't think that I would care for it. I was wrong. We loved it! 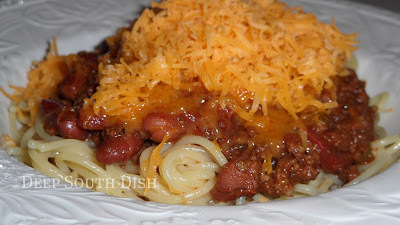 This recipe isn't authentic Skyline, but is really just my chili served Cincinnati style over spaghetti noodles with cheese. If you haven't tried it, give it a try just once. This Upside Down Pizza Casserole gives you the flavor of pizza, but in much less time. Layers of ingredients, beginning with Mozzarella cheese, topped with a meat sauce, and finished with a batter that produces a crust-like layer, makes this casserole much like an upside down deep dish pizza. We like green bell pepper, onion, beef and pepperoni on ours, but make it your own by adding your favorite pizza toppings. This Crunchy Beef and Onion Casserole is a well loved southern favorite. 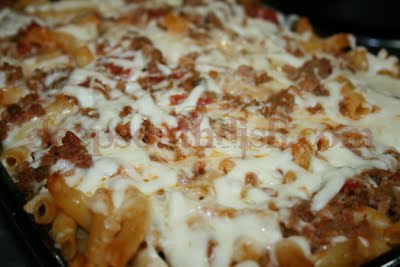 It's a basic but flavorful ground beef casserole, made with sauteed bell pepper, onion and garlic, cooked in a sauce of stewed tomatoes and cream of mushroom soup, and a few basic seasonings, but the finish with a layer of crunchy French fried onions just makes it. 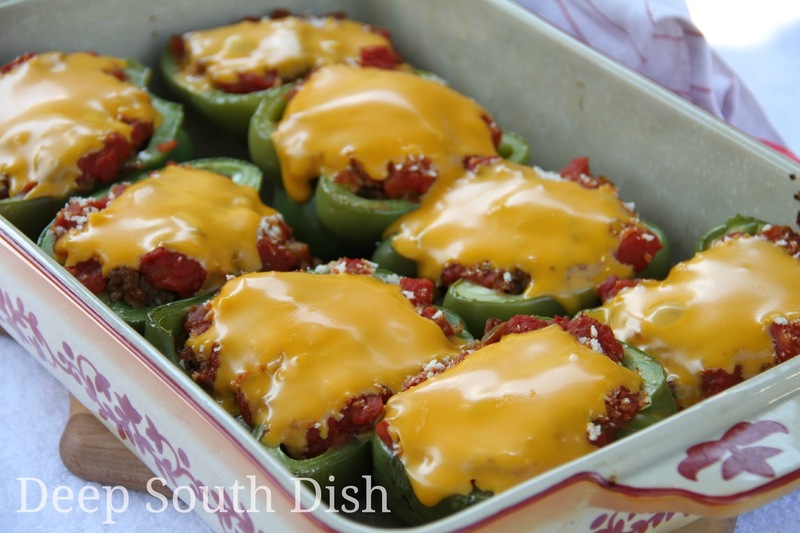 I adore these Creole Stuffed Peppers filled with a mixture of ground beef, Italian sausage, rice & a Creole tomato sauce, topped with cheddar cheese or slices of Velveeta and so does my husband. Well, the filling anyway - which means I get the extra sweet bell pepper! 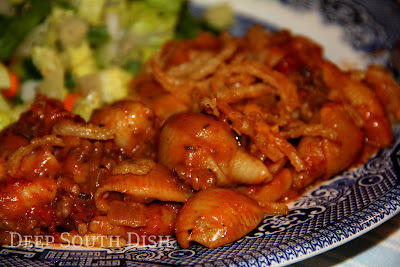 Don't you just love our American Goulash? Well, besides the more typical pasta, ground beef, Italian sausage, tomato, and a bit of garlic, I added in The Trinity, a bit of Cajun seasoning, and some mild andouille sausage to southernize it just a tad, making it even better. Total comfort food, and ... it's all stovetop! So it's a quick & easy meal that is delicious. Tater Tot Casserole is a well loved casserole of ground beef, but I add in some smoked sausage, and season it with sweet onion and bell pepper, finish it with a cream soup sauce and top it with crispy, crunchy tater tot potatoes and a little cheese. Yum y'all! This Ground Beef Mac and Cheese Casserole starts with a simple box of macaroni and cheese and is a weeknight favorite around our house. It comes together easy and bakes in no time. It's also a potluck favorite (double it) because while it's basic, it's well seasoned, flavorful and just good old fashioned comfort food. Nobody will know you started with a box of mac and cheese, well, unless you tell them! 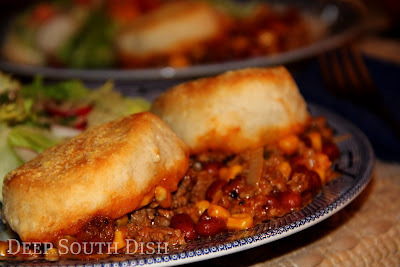 Chuck Wagon Casserole is a hardy casserole of ground beef, seasoned with onion and bell pepper, some beans and corn, a little mixture of chili seasonings and topped off with rustic, cornmeal dusted biscuits. Just delicious. 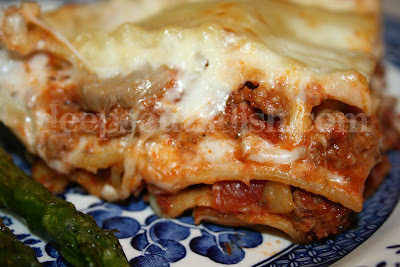 Homemade lasagna can be a bit daunting at times, but this Beef, Andouille and Mushroom Lasagna made with ground beef, andouille sausage and mushrooms works perfectly and is just delicious. This is a keeper and a go-to recipe we love and it is so easy it's ridiculous! Baked Spaghetti, is very different from your usual regular spaghetti and meat sauce, and is a fantastic meal for anytime, but most especially for feeding a crowd, making it perfect for potlucks, church suppers and socials. This one has been a favorite around our house ever since the first time I made it. 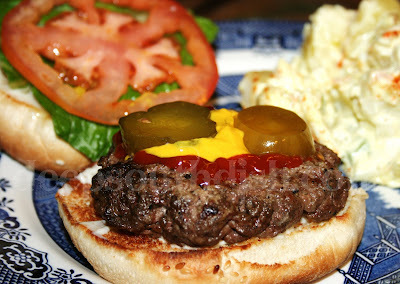 A good ole basic All American Burger is not fancy, but to me means a simple, classic, ground beef burger with a light brushing of butter, a sprinkle of salt and pepper, and dressed with mayonnaise, ketchup, mustard, pickles, tomato, onion and lettuce all on a toasted bun. Throw a little cheese on there, and you've got your classic cheeseburger. 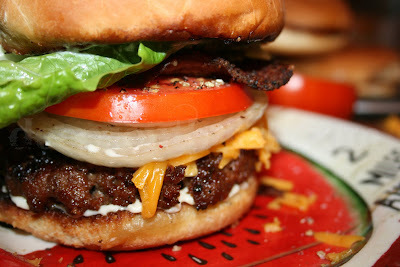 Add some bacon, and you got yourself a nice bacon cheeseburger. To me, a good Cowboy Burger should have a smoky element and a spicy element - Worcestershire, BBQ & steak sauce, just a dash of Liquid Smoke, and a bit of cayenne and chipotle chili powder works here. Top it with thick cut peppered bacon. 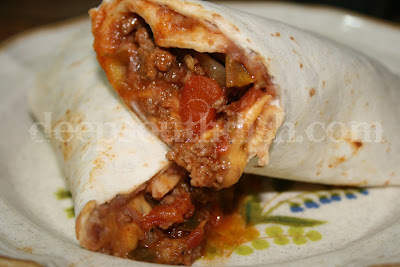 I love Bean and Beef Burritos especially when they are made at home. 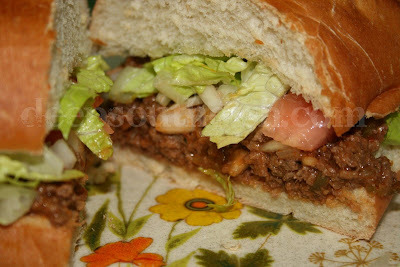 Simply seasoned ground beef married with refried beans, these are just delicious and so easy. 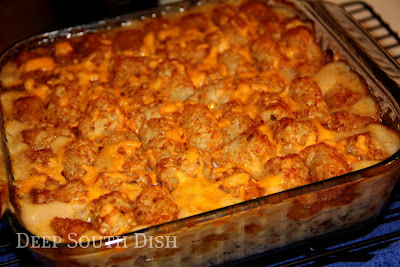 You can also turn this into a casserole and don't miss the skillet version below. I won't go so far as to say this Cajun Hot Dog Sauce qualifies as anything near a Coney Island hot dog sauce, but it's sort of patterned after that. Of course I had to add a tad bit of Cajun flair with some Louisiana hot sauce and my near and dear to me Slap Ya Mama Cajun seasoning. Not at all like chili on a hot dog, and really sort of non-descript all on it's own, but marry the sauce with the dog and it's heaven, I tell ya! This is my favorite Basic Homemade Meatball recipe that I have been using since I started cooking, and the same one I use when I make my spaghetti with meatballs, for meatball subs, in casseroles and for those famous grape jelly meatballs that we southerners are so endeared to. 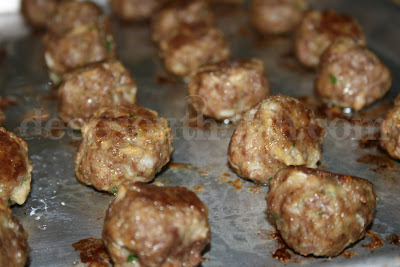 It is a very basic meatball recipe that you can certainly jazz up by adding whatever extras you like. I prefer them simple with very basic seasonings. Course I love those burritos, but this Beef and Bean Burrito Skillet recipe transfers that flavor into the ease of a skillet meal. Made from scratch, it's fresh and just delicious. If you are in a rush, you can speed stove to table time by substituting a package of taco seasoning (eliminating all items beginning with salt through to, and including, the oregano) and a can of refried beans for the pintos and Sazon. This Cajun Rice Dressing is essentially a dirty rice recipe, jazzed up a bit with a small roux that can act as a meat or poultry stuffing or just simply as a side dish. I wondered if I finely minced the traditional giblets with the food processor, could I pull this off and get The Cajun to at least taste it. It worked, he did and he loved it. I never said a word about it. You can certainly leave them out as well. A slightly southernized version of baked ziti, made with the Trinity of southern vegetables, tiny beef and sausage meatballs, a tomato based sauce with Italian sausage and mozzarella and Parmesan cheeses. Basic Meatloaf is a definite favorite. 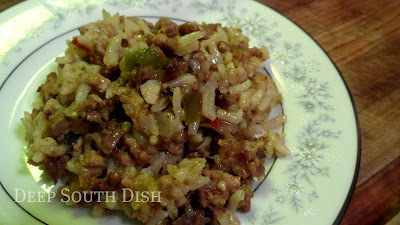 Very simply made with lean ground beef, finely minced onion, green onion, celery, and green pepper, it is shown here with a Brown Gravy, though I more often make it with a tomato brown sugar sauce. Great for next day sandwiches. 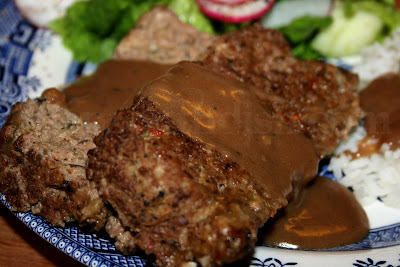 Hamburger Steak has been a site favorite ever since I posted it here on Deep South Dish. 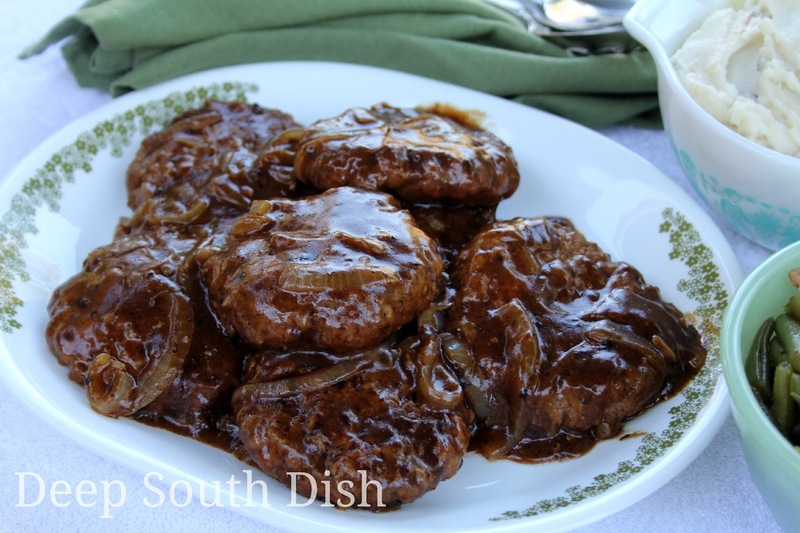 It's a simple diner classic and a southern favorite comfort food of simply seasoned ground beef patties cooked with caramelized onion and gravy. Definitely a belly-pleaser. Every one of those recipes was mouth-watering! I'm drooling on my keyboard as I type! I was a little hungry until I read this, now I'm starving - I'd enjoy every one of them. So many of these recipes remind me of growing up in Mississippi. Seems like my mom covered all 25 of these! I'm buy ground sirloin when its on sale and pop it in the freezer. I'm always looking for new ideas for cooking it up! I love patty melts but don't think I've ever made them...I need to remedy that. Everything looks great, especially love the cincinnati chili. Thank you for posting this wonderful tutorial on ground beef. I've been stuck in a summertime blues cooking rut, but now I have plenty of go-to recipes! Love and a big thank-you from Alabama. 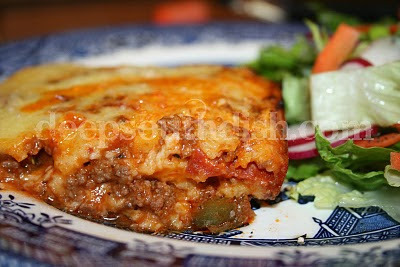 Well...you've done it again, Mary...made my mouth water looking at all these yummy recipes! The best part though, ground chuck/hamburger is on sale this week in my part of the country! Yeah for my budget!! Thank you, Mary, for going to the trouble of posting all those wonderful recipes. I want to try them ALL! Yum! Great list of recipes. It will be handy on those days where you are staring at a pound of ground beef and trying to think of something other than burgers, tacos or spaghetti. I loved all of the recipes! Just wish hubby would eat green pepper, mushrooms and tomatos. I see you made Skyline Chili without Cincinnati style chili. Tsk Tsk. Everyone should be broad-minded and try Cincinnati style chili. Just stop thinking it should taste like what you're used to. It is really good, better with the spaghetti than southwestern style. You can serve it with just the chili or topped with cheese, sour cream, onions, or all 3. Just google for the recipe. Sour cream on Cincy-style chili. Talk about a no-no. Just chili and spaghetti =chili spaghetti." 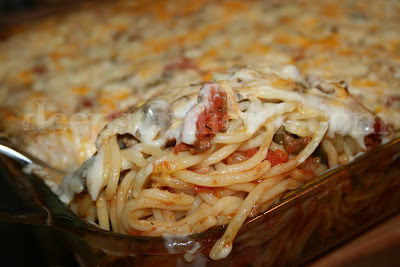 A chili spaghetti with cheese = a "3-way" Add beans or chopped onions = chili "4-way." Cheese, beans and onions = "5-way". Also, don't forget the oyster crackers and please pass the hot sauce. 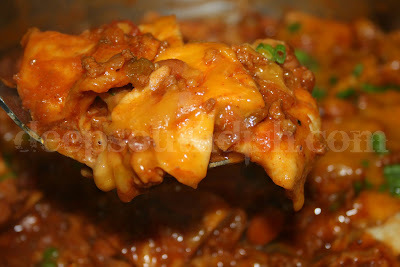 Also, try the recipe with the chili ladled on top of the cheese and other toppings or "inverted." I found this site via pinterest and I am so excited! There's maybe only one that I don't think I'll use - unlike other places where I only find one or two to use! Fabulous post!! Thanks so much Sydnee and welcome!! I'm gonna try the upside down pizza casserole. It sounds so yummy. Plus, I think my kids will love it. Thanks for so many WONDERFUL recipes!!!! I hope they do Kelli! I'm going to try most of them, thanks for sharing. I hope you enjoy them Shontessia! Be sure to check that link at the top that has 23 more updated recipes listed too! Haven't purchased ground beef in a couple of years, but recently started grinding my own in my food processor. Have really missed having some of these classics for supper. Thanks for putting them all in one place so I can get my ground beef fix! Home ground is always the best - you know what's in there! Be sure to also check out the other link for more of my ground beef collection too. OMG Mary!! I just scrolled through and these look so so so good! I'll be back to look at each one when I have more time. Pinning for now!! THANKS!! Thank you Kim! I hope you find some favs to enjoy!! Used ground chuck for years. Its easy meat you can use in so many different ways. One. However there is at least one bASS in every crowd. Mary thank you so much for your time and efforts you put into this site . 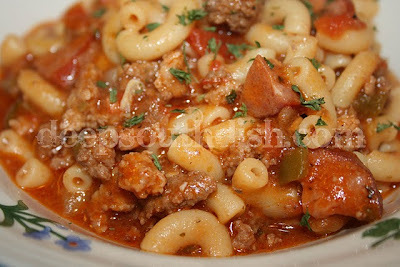 My Hubby loves classic goulash. I swear he could eat it every day. I like it but it's not a comfort food for me as it is for him. He mentioned he would like to make goulash soon. I saw this one hoping he would be interested in it. I knew he would because it has all the things he likes. He was game so we made this tonight. Since Italian sausage only comes in 1 lb., we used it all. The smallest andouille sausage we could find was 3 links 3/4 lb. I hate freezing small amounts of meat because they usually get lost in our freezer and become unrecognizable. So we used two of them which is 1/4 lb. more than the recipe calls for, since hubby said he would eat the other one tomorrow in a sandwich. Besides adding extra meat, we followed the recipe exactly. We both LOVED it! I'm thankful I can suggest this one occasionally instead of having to eat the classic one so much haha! It has just the right amount of spice. Texas Toast goes really well with this dish. Thank you Mary for another fabulous recipe and saving for me! It will go into our cook book with DEEP SOUTH DISH on it! I'm so glad to hear that y'all enjoyed it Kilyena and thanks so much for taking the time to stop by and let me know. That always means a lot! VERY GOOD!!!! Great round up Mary! I mixed soup & water with beef for easy assembly, added oregano, garlic and parsley instead of salt, pepper. I never buy ground beef anymore but just bought it on a whim the other day. So many things I could do with it!! I can't choose! Do you have ground turkey recipes as well for the nights I wanna make dinner a little bit healthier? Hi ToniCorrine! I hope you enjoy trying out a few things with that ground beef and be sure to visit the second collection too for a few more recipes. As to the ground turkey, you can use any of the ground beef recipes, just remember that since it is much leaner, you'll need to bump up seasonings a bit to make up for the lack of flavor from the fat. Just experiment a bit with some of your favorites!